Leeds United beat Cardiff City to register their first win at Elland Road since 4 March. Neither side showed any cutting edge in a dull first half before Sean Morrison saw his header saved by Leeds keeper Marco Silvestri after the break. 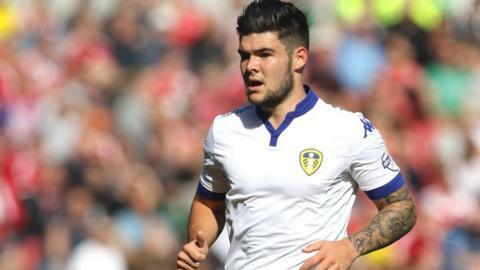 Alex Mowatt scored the only goal of the game with a brilliant long-range strike in the 63rd minute. Home striker Chris Wood should have made it 2-0 but shot wide with the goal at his mercy. As well as being a first home success of the season, the victory also gave Steve Evans his first win since replacing Uwe Rosler last month. Whites chairman Massimo Cellino, who has agreed a deal in principle to sell his majority stake to supporters group Leeds Fans United, was not present for the game after vowing on Monday to no longer attend matches. The first half saw little action, with Leeds winger Stuart Dallas going closest with a shot that was beaten away by Bluebirds keeper David Marshall. Cardiff carried more of a threat in the second period but found themselves behind when Mowatt struck home a superb effort to give Leeds a first goal from open play since 19 September. Silvestri saved from Joe Mason and Morrison for a second time before Wood missed a great chance to wrap up the victory when he failed to hit the target having gone round Marshall in the dying minutes. "At the end of the game I was quite an emotional man, I was welling up. "If I achieve nothing else I have won a game in charge of a famous football club at Elland Road. "We were all down after the Blackburn game - it was the worst birthday I have had. I then spoke to the players about having some passion and drive. "I'm very proud now. I was so down after last Thursday but had to lift them and I told them the minimum we needed was effort." Match ends, Leeds United 1, Cardiff City 0. Second Half ends, Leeds United 1, Cardiff City 0. Attempt blocked. Souleymane Doukara (Leeds United) right footed shot from outside the box is blocked. Assisted by Liam Cooper. Attempt missed. Anthony Pilkington (Cardiff City) left footed shot from outside the box is high and wide to the left. Assisted by Sammy Ameobi. Attempt missed. Chris Wood (Leeds United) right footed shot from a difficult angle on the left is close, but misses to the left. Substitution, Leeds United. Sam Byram replaces Stuart Dallas. Corner, Cardiff City. Conceded by Gaetano Berardi. Attempt saved. Sean Morrison (Cardiff City) header from the centre of the box is saved in the centre of the goal. Assisted by Peter Whittingham with a cross. Attempt saved. Joe Mason (Cardiff City) right footed shot from outside the box is saved in the bottom left corner. Assisted by Kenwyne Jones. Delay in match Scott Malone (Cardiff City) because of an injury. Scott Malone (Cardiff City) wins a free kick on the left wing. Alex Mowatt (Leeds United) wins a free kick on the left wing. Goal! Leeds United 1, Cardiff City 0. Alex Mowatt (Leeds United) left footed shot from outside the box to the top right corner. Assisted by Mirco Antenucci. Corner, Leeds United. Conceded by David Marshall.